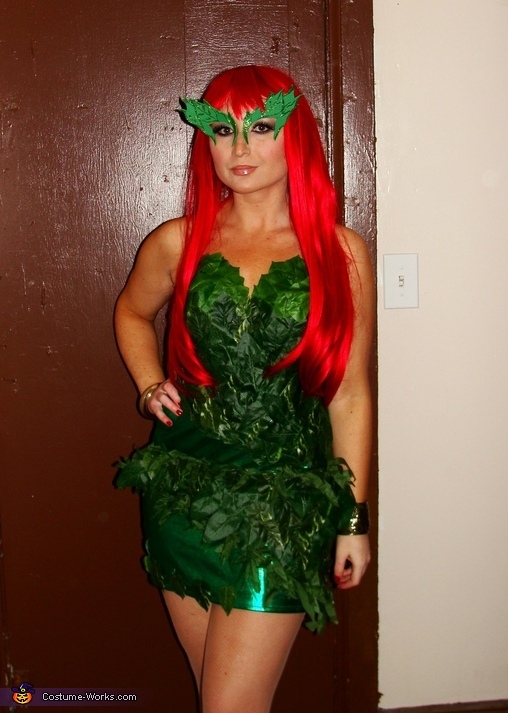 My costume was inspired by Kim Kardashian's Poison Ivy costume that she wore in 2011. I made the whole costume myself. I purchased a green dress and then I bought four different types of leaves at the dollar store to glue gun to the dress in the same pattern that Kim had on her dress. For the eyebrows I found a stencil online and traced it onto green felt and then cut it out and glued the pieces together. I then took glitter and traced along the edges for some added shimmer. Gold jewellery and a red wig completed my look. My whole costume from head to toe cost around $85. The dress on it's own is actually from a martian costume I bought at a Halloween store, it cost me $20. Do you wanna sell this?? At this time, I don't plan on selling my costume. Amazing camilla i did always love this costume i had no idea you made it. That makes this costume so much better! Could u make me one and I can buy from u just asking cuz u know how to do it all ready.